Rotor slip ring for CS121 and CS130 vehicles found in Buick, Chevrolet, Daewood, Eagle, Geo, GMC, Isuzu, Jeep, Oldsmobile, Pontiac, and Saturn Vehicles from 1986 until 2002. 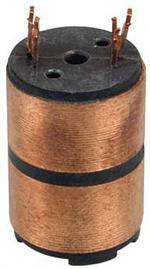 Rotor slip ring with welding tabs for CS121 and CS130 vehicles found in Buick, Chevrolet, Daewood, Eagle, Geo, GMC, Isuzu, Jeep, Oldsmobile, Pontiac, and Saturn Vehicles from 1986 until 2002. Rotor slip ring for Delco 15Si, 17Si, and CS144 series alternators. 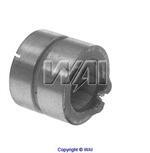 Used on '89 to '02 AM General, Buick, Cadillac, Chevrolete, GMC, Oldsmobile, and Pontiac vehicles. Rotor slip ring for Delco CS130D style alternators. Used on Late 90s, Early 00s Acura, Buick, Chevrolet, Crusador, Daewoo, GMC, Honda, Isuzu, Mercruiser, Oldsmobile, Pleasurecraft, Pontiac, Porsche, and Volkswagen vehicles. 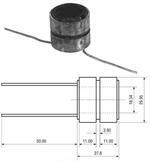 Replacement slip ring for Delco CS144 series alternator rotors. Replacement slip ring for rotors used on Delco 31Si alternators. Replaces OE Delco numbers 10485137 and 10493258. Rotor slip ring for Ford 3G series alternators. The slip ring is where the brushes ride and allow power to flow into the rotor coil. Should be soldered to the coil with a high temperature solder.